To many, Lady Lamb is an enigma. Her songs are at once intimate and unbridled– both deeply personal and existentially contemplative. Aly Spaltro is a fearless performer who can command a pitch-black stage with nothing more than her voice. Yet, when the band bursts in and the lights come up, what began as a demonstration of restraint shifts seamlessly into an emphatic snarl. Currently, Lady Lamb is on her full North American Tour performing her latest single, "Billions Of Eyes" released in late 2014. Gospel Machine is garage gospel band out of Northeast Minneapolis resurrecting the soul and R&B styles of the 1960's. The band features Jayanthi Kyle (Romantica, Black Audience) on vocals and members of Twin Cities rock band The Small Cities - Wes Burdine (guitar, backing vox), Jimmy Osterholt (Bass), Scott Munson (keys), and David Osborn (drums). 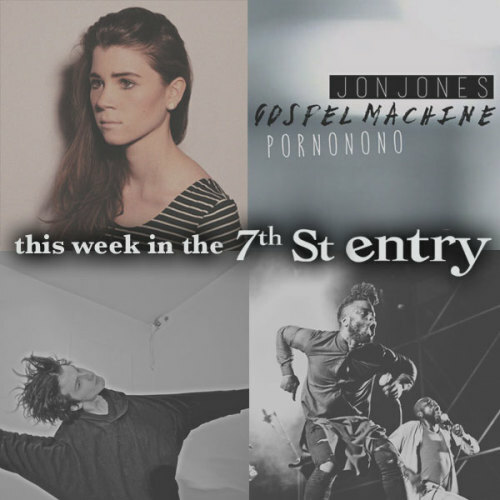 Two other Minneapolis artists will take the stage Monday including the smooth R&B of Jon Jones and his debut album, Impression, along with City Pages' latest "Best Band Name of 2015" winner, Pornonono. Filthy Animals is a St. Paul Indie Rock group that blends Funk, R&B, and Psychedelic influences to create heavy grooves and lush soundscapes. Rat Pit hails from St. Paul as well and formed in the back of a '98 Saturn SL4. Rat Pit combines rock 'n roll with the energy of a 19th century underground cellar party. The standard four man lineup - two guitars, bass and drums - was formed in July 2012. Beau Blue & The Confused give a new sound to your favs as well as some soulful originals. Although originating in college in Grand Forks, ND, Beau Blue and the Confused have just recently been expanding their sound into the Minneapolis live music scene. Doldrums latest album, The Air Conditioned Nightmare is punk rock in its DIY beginnings and militant commitment to originality. Doldrums' is a self-contained world, in the same way that Portishead and Wu Tang Clan defined their own universe of sound. Their latest release is an album of texture and taste, an extra-sensory overload. Weaving through the mix are Woodhead's own androgynous, tweaked vocals singing snatches of lyrics like voices down broken phone-lines. Ten snatched seconds is enough to pull you in. Because ultimately The Air Conditioned Nightmare stands alone. Doldrums have created something special. You need to hear them. Young Fathers were christened in 2008, named after the fact that all three members were named for their fathers. They are: ‘G' Hastings, from Drylaw, Edinburgh, Alloysious Massaquoi, originally from Liberia via Ghana and Kayus Bankole, born in Edinburgh to Nigerian parents but partially raised in Maryland in the USA, all 27 years old. Their live shows are complimented by Steven Morrison (drums & DJ) and Lauren Holt (AKA LAWholt - vocals). The new album, White Men Are Black Men Too, has been recorded at various places around the world, including Melbourne and London as well as Berlin and Edinburgh and features the Leith Congregational Choir on a couple of tracks. CSL is a Minneapolis native and local electronic-folk artist. With instrumentation ranging from classical guitar to atmospheric synthesizers, symbiotic drums and analog bass rhythms, this one-man outfit combines electronic sensibilities with the textures of traditional folk instruments. In his eclectic arrangements, Lee's vocal sampling and live singing layer on the atmospheric goodness. Warehouse Eyes is the dream-pop duo of Jennie Lahlum (vocals/synth) and Christopher Williams (vocals, keys, synth). Inspired by the endless possibilities of sound design and by rock and roll poets like Patti Smith, John Darnielle and Bob Dylan. What began as playing simple original piano pop songs and Low covers gradually morphed into a five-piece band as they learned the energy and complexity their songs demanded. They put their first EP Carvings out in 2014 and are in the midst of a busy 2015 including the release of their second EP Prisms. On the twelve songs comprising San Francisco-based romantic indie pop outfit Geographer's fourth proper studio album, Ghost Modern, composer, songwriter and multi-instrumentalist Mike Deni creates timeless compositions with blossoming synthesizers paired with precise orchestral arrangements. Growing increasingly tired with the lack of emphasis on songwriting prevalent in today's popular culture, here Geographer has fashioned their most cohesive and compelling work to date. “I took a great deal of time crafting the songs for this album before arranging them, before blowing them out with swelling sonic textures that might override or overshadow the need to make the song – at its core – the most important thing,” explains Deni.